American consumers are now more likely to pay off their cell phone bill than their auto loan, a new report by PeerIQ has found. However, instead of focusing on this as a potential catalyst for more pain in the already precarious world of auto loans, the media, always the finder of silver linings, is emphasizing how this finding will boost demand for securities that are backed by cell phone purchases going forward. The shift is increasing the attractiveness of bonds generated from mobile-phone loans, a small but growing portion of the asset-backed securities market. While just $7.7 billion of bonds backed by phone purchases have been issued since 2016 -- and all by Verizon Communications Inc. -- the number may increase over coming years. The reason for the skewed importance is simple: mobile phones have become a universal hub of information and accessibility, allowing consumers to order car rides wherever they need at the push of a button while enjoying the wealth of information and productivity provided by a cell phone, including having anything you want delivered directly to your house, making it a more important accessory than owning a car. Of course, one can simply spend hours each day on Facebook stalking one's ex, which is what most use it for. 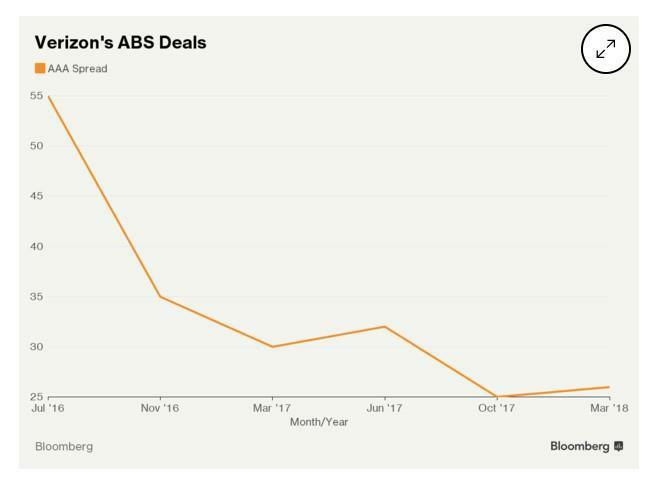 Yet despite the "stickyness" of mobile phone cash flows, so far Verizon has been the only company to take advantage of issuing securities backed by it’s cell phone contracts. Incidentally, based on their spreads, the market is treating such cell-phone backed securities on part with prime auto loans. While the market is set for growth, so far there have only been six sales by Verizon, the largest U.S. mobile-phone carrier. Its bonds are backed by customers’ monthly device payments, which are usually bundled with their service bills. 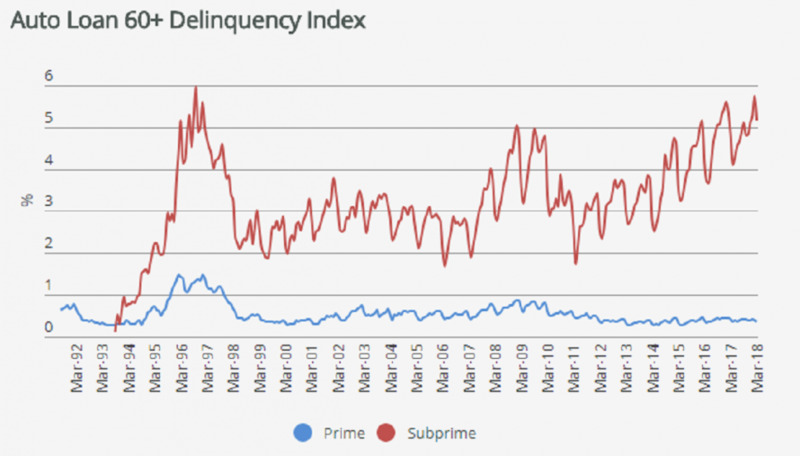 The spreads on the securities have tightened and are generally in line with prime auto debt. And while the above is good news for cell phone sellers and consumer hoping to find easy cell phone financing terms, it's not so good for providers of auto loans, because as less creditworthy borrowers continue focus on paying off their cell phone bills instead of paying their car payments, this would lead to growing auto loan delinquencies. In 2007 and 2008, one of the reasons for the housing crisis was because it no longer made sense for homeowners to keep paying off their house: either it was worth less than what they paid, they had already extracted the equity from it it simply wasn’t a priority for them anymore, or they simply couldn't afford it. Ten years later we are back in the same place. Angel Oak sold its Verizon cell-phone bonds, but Triick said his team would consider buying similar securities in the future if there is an attractive entry point, perhaps when new issuers come to the market. The idea of creating a brand new bubble in the latest and greatest securitization - cell phone-backed debt securities - is appealing to many, and we have no doubt that companies will be ravenously elbowing each other out of the way to corner the market and issue the riskiest contract backed debt securities possible in as short amount of time as possible to help "diversify" the risk. This will ultimately create yet another more bubble we will have to deal with in the future. 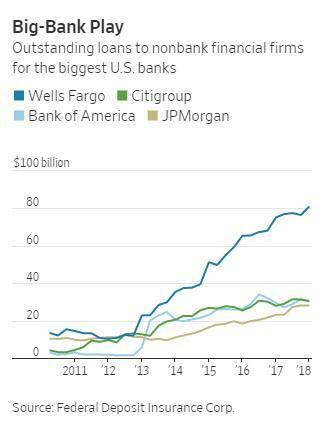 However, until then, everyone will be focusing on the new cash flows, ignoring how this will effect other outstanding paper; and nobody is pointing out that this could further exacerbate the already dire auto loan industry. Meanwhile, as readers will recall, the subprime auto industry is already in a crisis of its own. As we reported just days ago, default rates are now higher than during the financial crisis. One month ago, when discussing the most recent trends in the US subprime auto loan space, we revealed how despite a virtual halt in direct loans by depositor banks to subprime clients following the financial crisis, the US banking sector now has over a third of a trillion dollars in indirect subprime exposure, in the form of loans to nonbanks financial firms which in the past decade have become the most aggressive lenders to America's sub-620 FICO population. But while the supply side of the subprime equation is clearly firing on all cylinders - as only the next crash/crisis will stop desperate yield chasers - things on the demand side are going from bad to worse, and according to the latest Fitch Autoloan delinquency data, consumers are defaulting on subprime auto loans at a higher rate than during the 2008-2009 financial crisis. 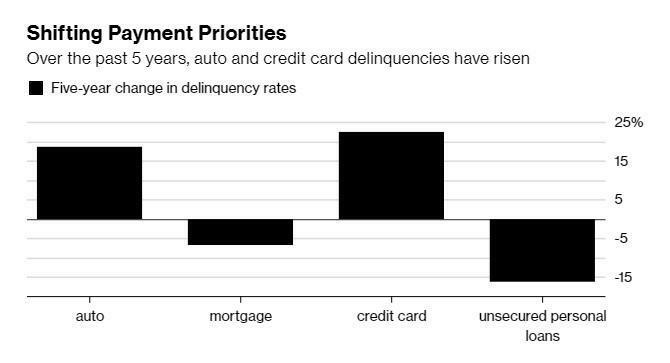 It will be ironic if the tipping point that sends the house of subprime auto cards crashing is something as trivial and "novel" as securitized cell phone bills. 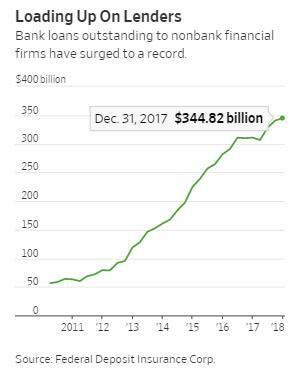 And come to think of it, how is it possible that deep into the "second longest expansion in US history", millions of American consumers can't even afford to purchase their cell phones outright and instead will serve as the basis for yet another prime, then subprime, securitization bubble product?